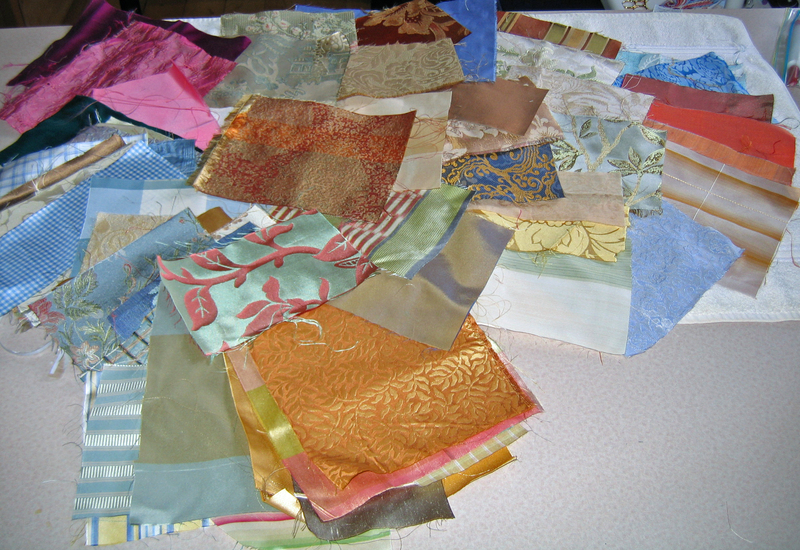 In December, still hyperactive and manic, I signed up for the Crazy Quilt Journal Project, as well as TAST. I was hoping these challenges would help me settle down and get back to stitching.While in that manic state, I began to think about ideas for a quilt made of the 12 blocks for CQJP. I wanted to have an idea for the whole, not just make isolated blocks. Cézanne came to mind. 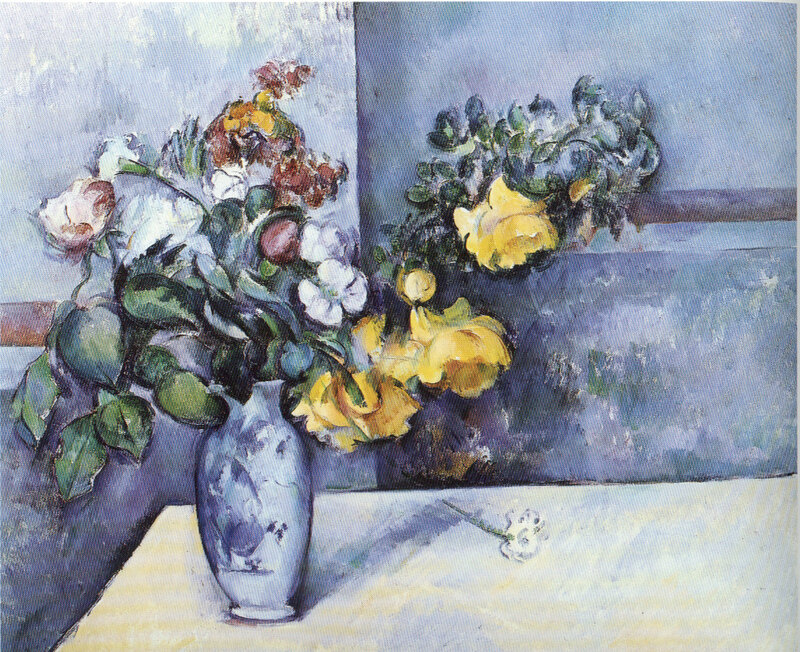 I love the palette of his landscape and still life paintings and decided I would try working with his colors. After looking at lots of his paintings in my books, I chose two as the basis for my CQJP color scheme. Going through my stash, I began collecting possible materials and noting what I needed to buy. I did some block designs in pencil. Then in January, I crashed. The ADHD was gone, and so was all my energy. I was incapacitated. That brought a time-out for five weeks of solitude and silence and by March I was feeling much better. But wouldn’t you know? I did too much and have had to put myself back into retreat and rest mode. Consequently, I have not been able to keep up with TAST, nor have I even been able to complete the January block for CQJP. But at least I’m not manic anymore, and I continue to hope I’ll get back to stitching. 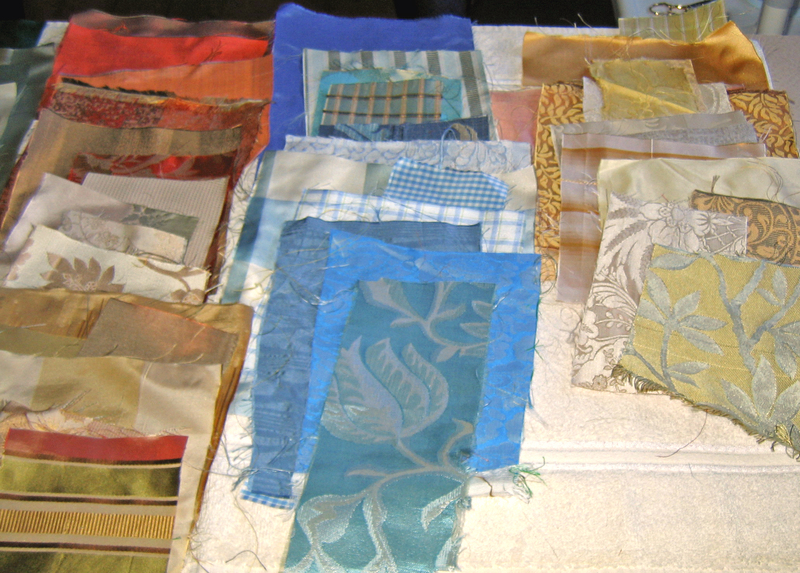 Recently, Susan Elliott posted about Delectable Mountain Cloth in her blog, Plays With Needles. 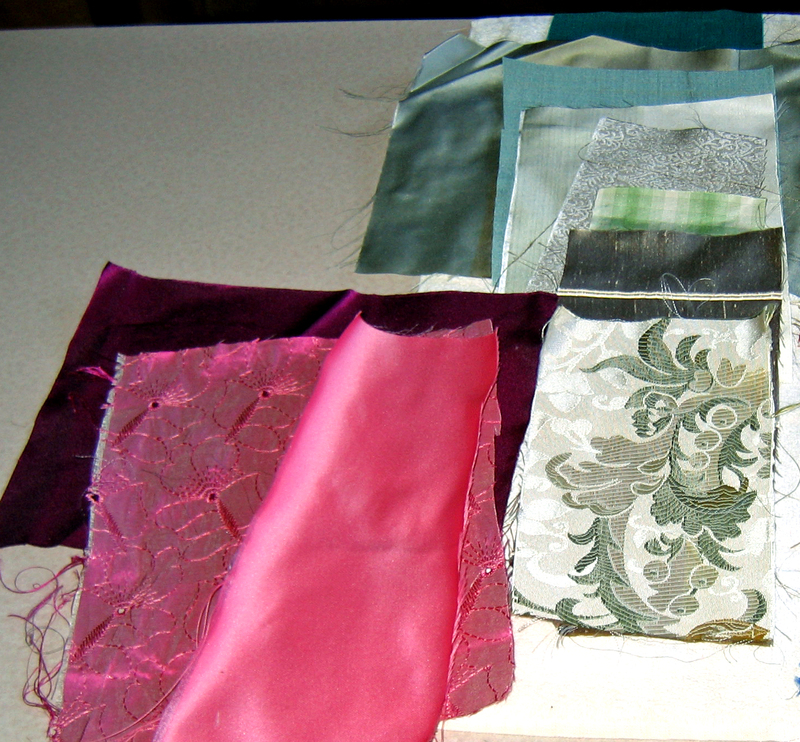 There I learned about the small piece assortments of silk fabrics DMC offers. Susan shows wonderful photographs of the small pieces she had received. I sent DMC an e-mail with scans of the two paintings attached, asking whether they could provide an assortment with any of the colors shown. Yesterday I received in the mail a package from DMC. 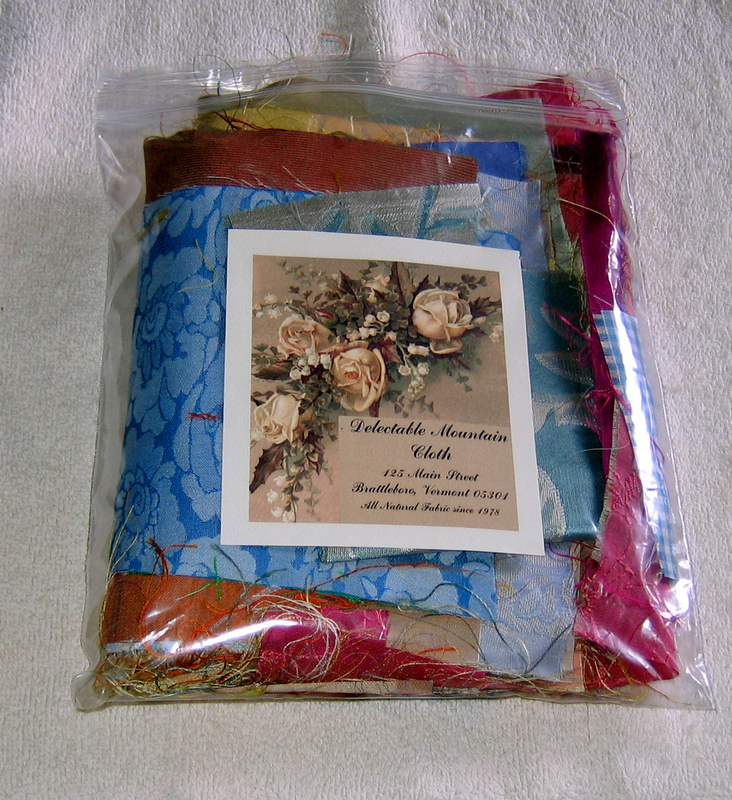 The $20.00 assortment came in a plastic baggie weighing six ounces. That’s not all of them. There’s more underneath. Gorgeous fabrics. I sorted them into color families. Here are the earthy ochres and sandy tones, the blues, and the yellows. Here are the reds and greens. And then there are some uncategorizable mixes. Unfortunately, some of the colors of the brocades washed out in the camera flash. 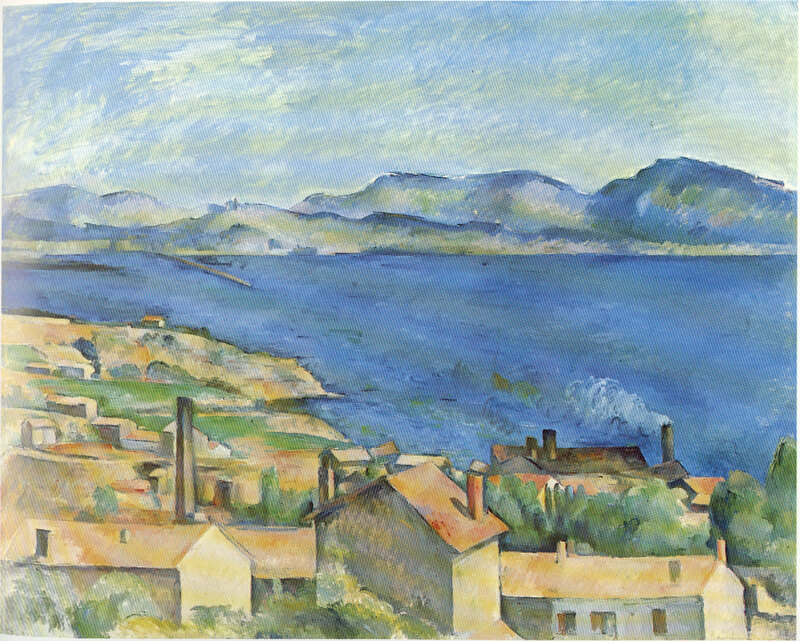 If you go back to the Cézanne paintings, you will see that I have his palette in silk fabrics. Still lacking in energy, still resting a lot, I haven’t even been able to conceive of designs or plans. I’m hoping that’s going to change. 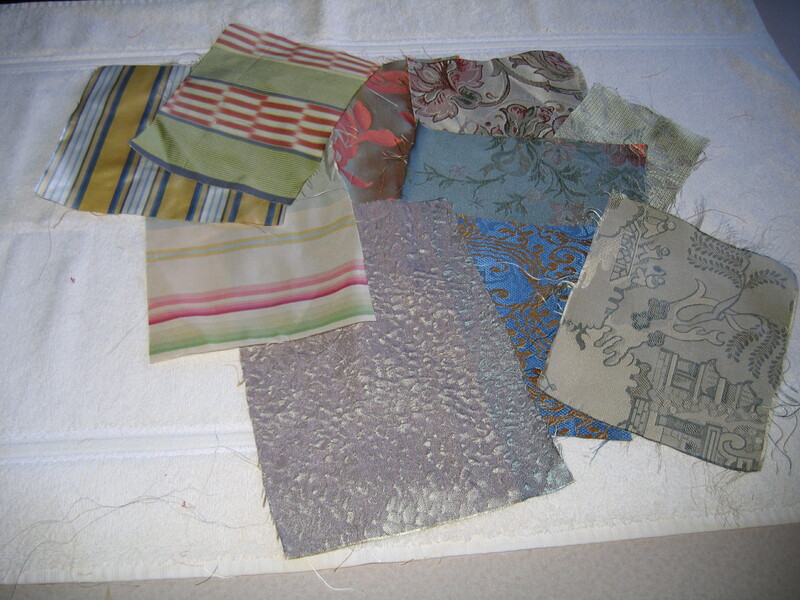 Now I am hoping these beautiful fabrics will inspire me to get to work. goodness! they are truly delectable. glad your symptoms are abating.